The Legends' Guild is home to the most adventurous and successful questers in RuneScape. It offers several useful perks, including a totem where you can charge Combat Bracelets, two stores where you can buy various helpful items (including the world-famous Legends' Cape), and a dungeon where you can train. 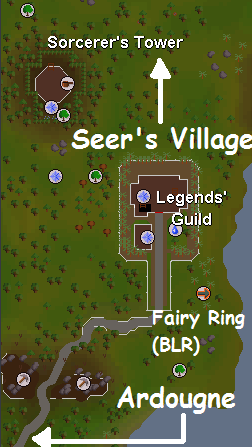 Walking from Seers' Village or Ardougne. Teleporting to the Ranging Guild with a Combat Bracelet, and then walking southeast to the Legends' Guild. 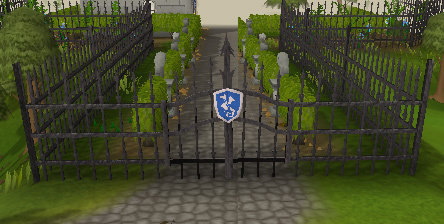 This is the front gate of the Legends' Guild. 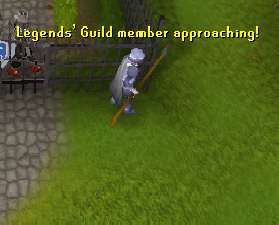 As you walk by, the guards will salute you because you are a Legends' Guild member. As you head to the main building you should see a little house where you started Legends' Quest where Sir Radimus Erkle used to be. You can find some Papyrus on his desk, as well as a Machete in the Cupboard. As you enter the main building you should find a large room with decorations such as swords and shields. You will see the golden totem pole that you got from Legends' Quest. You can recharge your Combat Bracelet here if all the charges were used. Here's what it would say if you looked at the totem pole and if you recharged your bracelet. You can also talk to Sir Radimus Erkle about While Guthix Sleeps Quest, one of the hardest quests in RuneScape. A woman named Fionella can be found on this floor. She runs the Legends' Guild General Store that sells Swordfish, Apple Pie, Attack Potion and Steel Arrows. Here are the prices of those items. This floor has two sections. If you went through the east ladder you will find a bank where you can deposit your items and such. If you went through the west ladder you will find Siegfried Erkle. He runs the Legends' Guild Shop of Useful Items. When you trade him you'll see that he sells Mithril Seeds, Dusty Key, Maze Key, Right Half of The Dragon Square Shield and the almighty Legends Cape. Here are the prices of those items. You can bury the mithril seeds to grow flowers anywhere you want. When you bury them you have the option of taking the flower or leaving it on the ground. The Maze key is used to enter Melzar's Maze near Rimmington. 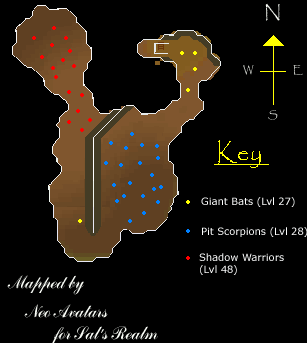 The Dusty Key is used to enter the gate with the Blue dragons in the Taverley Dungeon. The Right Half of The Dragon Square Shield can be smithed together with the Left half to get a Dragon square shield. You need 60 Defence to wear the shield. The Legends' Guild Dungeon contains three kinds of monsters: Giant Bats, Pit Scorpions, and Shadow Warriors. 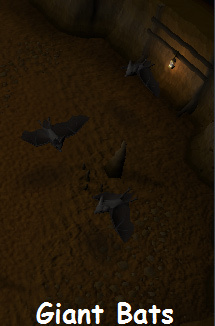 Here are the level 28 Giant Bats found at the beginning of the dungeon. While they can drop any kind of charm (gold, green, crimson and blue), they drop Gold Charms more often than the others. 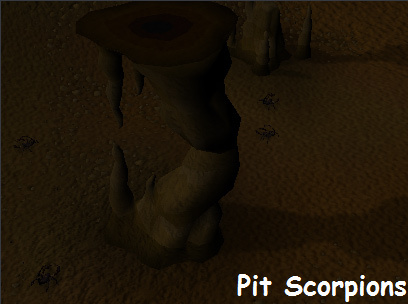 Here are the level 28 Pit Scorpions in the middle of the dungeon. 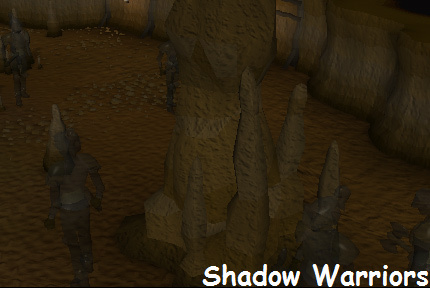 Here are the level 48 Shadow Warriors at the end of the dungeon. These creatures are mainly killed either for Slayer tasks, obtaining charms used in Summoning, or to obtain a Shield Left Half. There are 16 respawn locations of these monsters in the dungeon.